How do I eat Kale? Kale is one of those vegetables that became popular (or returned to popularity) a few years ago. This little gem gets a lot of attention for it’s nutritional punch. In a 3 ounce serving, raw kale provides 49 calories and is a rich source of vitamin A, vitamin C, vitamin K, vitamin B6, folate, and manganese. Kale is a good source of thiamin, riboflavin, pantothenic acid, vitamin E and several dietary minerals, including iron, calcium, potassium, and phosphorus. Boiling raw kale diminishes these nutrient contents, with the exception of vitamin K.
Add Kale to a smoothie just like you might add spinach to a smoothie. Massage it into a salad. Kale can seem a bit tough, but if you give it a good squeeze with your hands and some type of dressing, it softens up and becomes easier to chew and digest, without losing the benefits you get from eating it raw. I tried not to mention it last week, as I was hoping for some rain, but the name of the game this week has been “Irrigate, Irrigate, Irrigate!” It’s almost hard to remember having how wet it has been this spring when just a few short week[s ago everything so muddy that we couldn’t get transplants in the ground on time. Now, the rain has shut off and we haven’t been able to catch more than 30 hundredths, which is just enough to knock down the dust, but not enough to make anything grow. There will basically be water running at all times on the farm from now on. We have two wells running water in a million different directions in the hope of keeping water on everything. We had just a few plants still in trays in the greenhouse that got kicked out and put in the ground earlier this week. That included three varieties of nearly 800 pepper plants and five varieties of almost 400 tomatoes. Before we even had those plants in the ground, the greenhouse was getting filled back up with broccoli for the fall. We seeded 90 trays of broccoli and have about another 130 trays to go. I would like to say we have some fancy air seeder that seeds 72 seeds at a time, but some things are better done by hand, so each seed is pulled out of the packet and hand planted one-by-one, just like you might do at home. We also seeded seven varieties of winter squash in the field. We seed multiple varieties of every crop we plant, partially because its neat to see an acorn squash next to a spaghetti squash next to a kabocha squash. But really, the multiple varieties planted act as a sort of insurance for us. For example, this spring we had those fun white satin carrots that we tried for the first time. They did great for us, but we had to replant all of the orange carrots twice before we had something that would grow. There are a couple things in this week’s produce that you may be seeing for the first time, be sure to look at the blog for some recipe ideas! As usual, there is much to report on the farm. We’ve done a few things this week that may not sound exciting but are important to growing veggies. We started off by putting shade cloth on our greenhouse. Shade cloth basically looks like a strong black mesh that we use to cover the outside of the greenhouse. When the summer heat starts bearing down on plants in June, it’s time to do something to cool them off and make the greenhouse a little more efficient. The greenhouse is now covered and we ordered shade cloth for the rest of the high tunnels this week. We’ve also painted plastic this week! Sounds crazy, but stick with me… Last week we put sweet potato slips into black plastic. Sweet potatoes aren’t started by seed like most other vegetables, they’re started from slips. 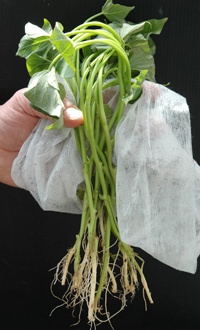 Slips are shoots that are grown from a mature sweet potato. When we put these slips into black plastic, the black plastic creates heat for the soil, but also additional heat on the plant. With the high temperatures this year, this could quickly burn up the plant. So the solution – turn our black plastic to white. In crop news…Remember those tomatoes that we tried to burn up last week? Well, it looks like we saved most of them. Unfortunately, peas just don’t take the heat as well as tomatoes, so the shelling peas and sugar snap peas are probably done until fall. The snow peas are hanging on, but not blooming right now. If it cools off a little and they start blooming, they may keep growing for a couple of weeks. We are starting to pick on some of the zucchini and squash plants this week. There are currently only a couple fruits to harvest out of all the plants, but if the heat backs off a little, the blossoms on the squash will quit dying and we should have a great crop. We started digging potatoes this week. My personal advice is to give them just a little rinse before cooking, but don’t scrub or peel them. The skins on these new potatoes are thin this time of year and delicious! My personal favorite is to combine potatoes, usually halved or quartered, with olive oil, seasoning salt and half a bunch of green onions to cook. What’s in this week’s CSA? We are excited about the produce in this week’s CSA! It feels like we are finally getting some good production out of the crops. This last week has felt more like the middle of summer than mid-June and the forecast looks to keep us in the upper 90s for some time. This has been good in some respects as the heat has helped the crops grow. The sweet corn is looking great and is just beginning to tassel. It also means that we are officially fully into the irrigation season and that means we have some long days and nights of moving water0 around the farm. The downside of the heat is that it is hard on some plants – and farmers too! The heat makes us watch the broccoli closely to see if it will make a head or if it will bolt (turn into a flower). Unfortunately, the heat has already turned several of the tomato plants we transplanted this week into tomato hay (It dried the plants to a crisp!) even while we were irrigating the plants. This week we seeded watermelon and cantaloupe. 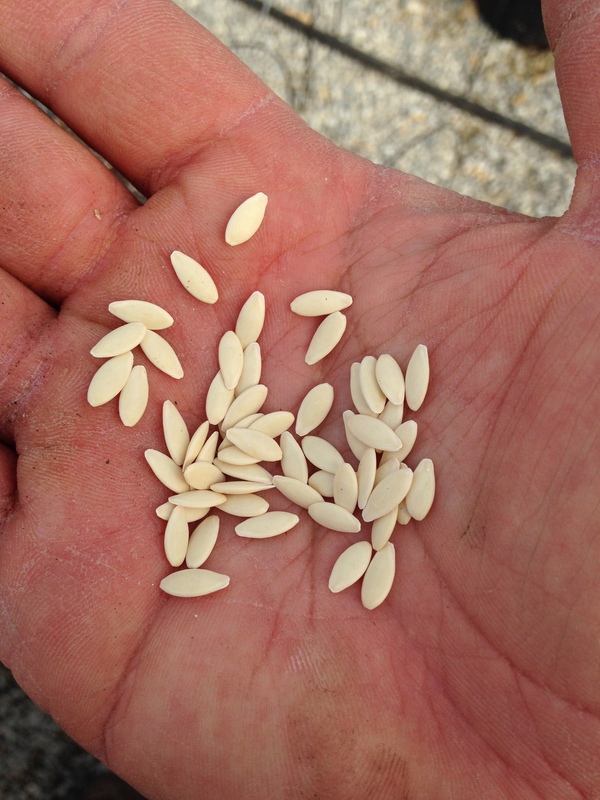 Did you know that a mouse will go through what we have seeded and pick out every single one of the cantaloupe seeds for a tasty snack, but leave the watermelon alone? There are just certain crops that the critters like best as seeds. Don’t worry though, the earlier planted melon plants are looking fantastic although they won’t be ready for some time. The no-till pumpkins we planted last week are starting to come up in the field. We transplanted another set of broccoli and kohlrabi in the field that are looking good. The potatoes were hilled, which basically means that soil is pulled up closer to the plant and a furrow, is created. This allows us to do a better job irrigating the plants. If you are anything like us, it seems like it gets harder and harder to have a sit down meal in the summer. Luckily, most vegetables can be eaten raw and that’s our favorite way around here. The other day, I had about 15 minutes, so I made some simple sauteed cauliflower. In a large skillet over medium heat, warm the oil. Saute one clove of garlic until the garlic just begins to brown (being careful to not let it burn!). Cut up your cauliflower into roughly equal sized pieces. Add the cauliflower and cook a few minutes, stirring, until completely coated in oil. Cook another 10-15 minutes Sprinkle with kosher salt to taste and serve. Week one of the CSA has come and gone with only a few hiccups. We are excited to report that there has been a lot happening on the farm this week. We have gone from wearing mud boots to kicking the dust as we walk about the farm. This means, irrigation season is upon us. There is a definite cycle to things on the farm. 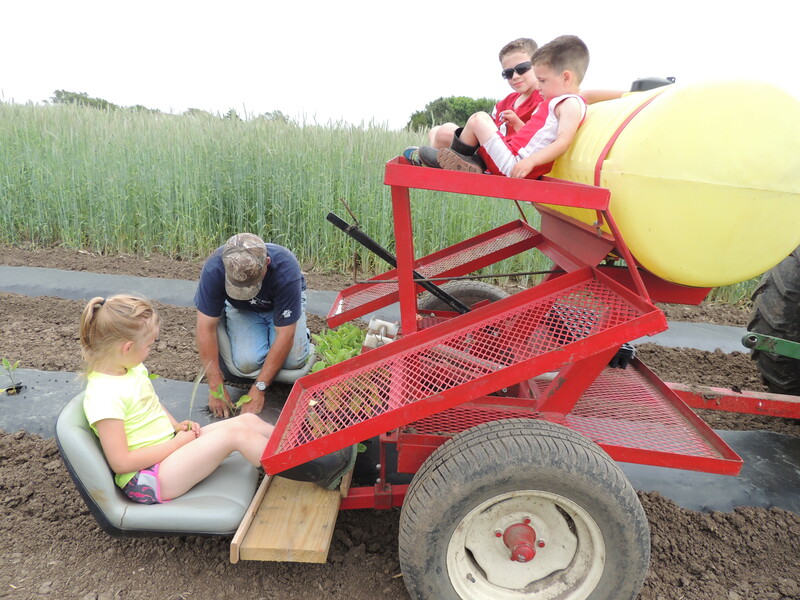 The work is never done and it seems like it’s always “too early” to be planting something – can you believe we’ve already planted our no-till pumpkins and winter squash this week?! Around here, we find that we are continually seeding, transplanting, irrigating, harvesting, discing, hilling… and starting over again. 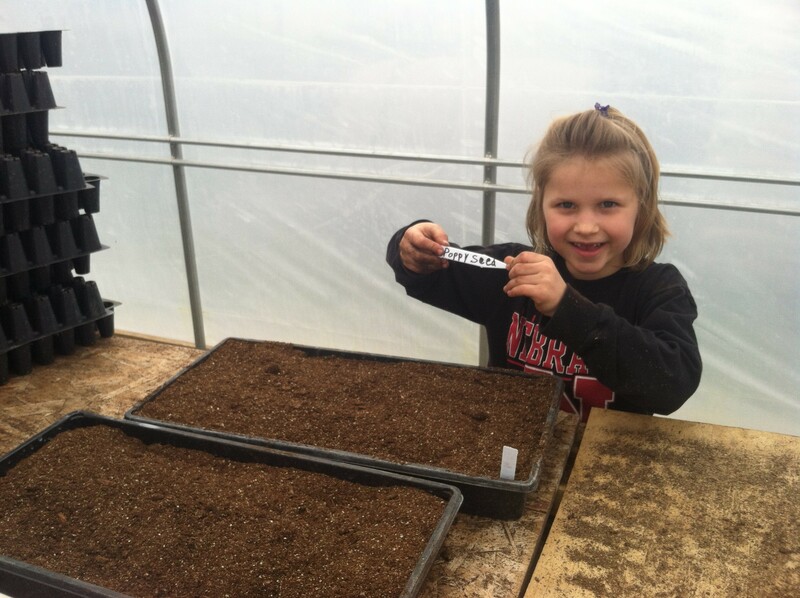 This week we have seeded radishes, sweetcorn, dill and green beans in the field and in the high tunnels. These crops will all be planted multiple times throughout the growing season. If I counted right, this is the 9th planting of radishes and we missed one or two plantings when we had so much rain and standing water. Some crops are seeded directly in the ground, while others are seeded in trays in the greenhouse first and then transplanted as a plug. This week we transplanted broccoli, kohlrabi, watermelon, cucumber, zucchini, summer squash, green onions and cantaloupe. Many of our plants get set out into plastic mulch. 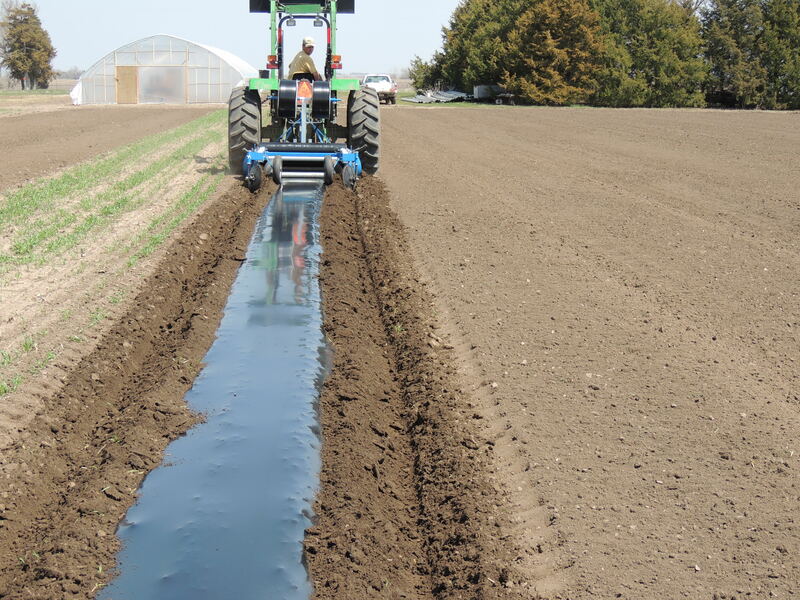 Plastic mulch basically looks like a layer of thin plastic that is about 3 feet wide in long straight rows in the field. It’s kind of like the weed barrier fabric that might get laid down in a flower garden. Unfortunately, some of our plastic mulch did not hold up well in the strong winds this spring. It was ripped from the ground completely in some places and simply plucked plants out of the ground in others. So this week we re-planted zucchini, yellow squash, watermelon, and cantaloupe where we lost crops due to wind and plastic. We would like to invite each of you out to the farm for a tour on Sunday June 26, 2016 from 2 – 4 pm. 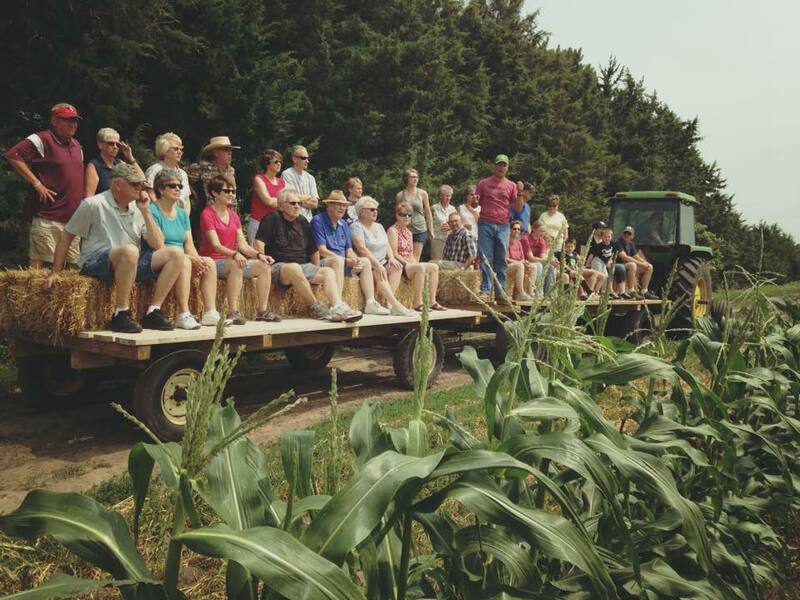 We will take you on a couple of hayrack rides around the farm. We will also take you on a tour through the greenhouse, high tunnels, and packing shed. Bring your family or bring a friend – this is your chance to see how your produce is grown, where it comes from and meet the crew.